It’s officially hot. Hot as in I don’t want to do anything that involves moving, all I want to do is sit in front of the fan. Fortunately, a light, refreshing summer drink can do much to make the heat more tolerable. Especially if that drink is prepped, sitting in the fridge, just waiting for you to drink it. I currently have three such drinks in the fridge. All are easy to prepare, and best chilled — meaning you make them, and then drink them over the next week. So long as you don’t add sugar, this is also quite a healthful way to quench your thirst. 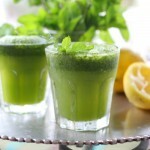 You can do this with a few branches of fresh mint, or with mint and lemons. Speaking of mint, the guys from Moshav Geulim have been selling bouquets of long, straight mint stalks at the Tel Aviv port farmer’s market. Speaking of the farmer’s market, it’s now open starting 3 p.m. Tuesdays for the summer, on top of the usual 8 a.m.-3 p.m. on Fridays. 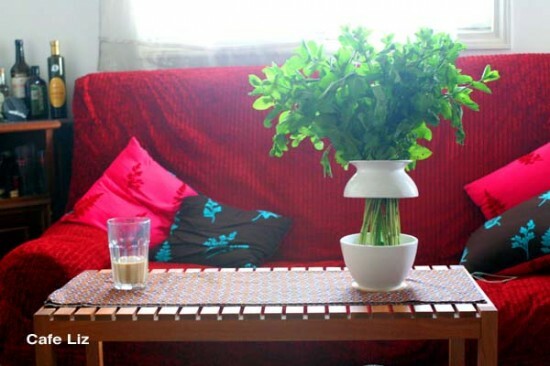 The vase in the photo is the Israeli design team Pickel:Pampanel’s bikini vase. 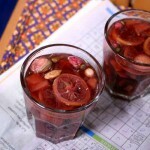 My friend Aviv makes very good iced teas with cinnamon bark, lemon verbena, cardamom pods and a few other spices. You can make this with any mix of pie spices (cinnamon, cardamom, cloves, etc.) and/or lemony herbs (lemon balm a.k.a. lemon geranium, lemon verbena, lemon grass, kaffir lime leaves). I made a very nice pitcher of tea in my French press with 5-6 pieces of cinnamon bark, two small sprigs of lemon balm and a cardamom pod. I’ve also made nice teas with cinnamon, a cardamom pod and a clove or two. I’ve found you can use the same pieces of cinnamon bark, cardamom and cloves in up to four batches of tea, if not more, before the sweetness in the spices completely disappears. Put your herbs/spices of choice in a glass container, infuse in hot water, add sugar if desired, and let cool. Keep in the fridge until you want a cold drink. Infuse the herbs in hot water, add sugar (or stevia) if desired, let cool and then refrigerate. This is the most classic way of making iced tea, but don’t expect it to come out tasting like Lipton’s (I still haven’t figured out what weird chemicals they’re putting in their tea to make it taste the way it does, aside from massive amounts of sugar). Infuse two tablespoons of your favorite tea leaves in about two cups of hot water, add a pinch of baking soda (this prevents bitterness), let seep for about 15 minutes, strain out the tea leaves, add sugar if desired (say, about two tablespoons), and dilute with two cups of cold water (at least — depending how strong you like your tea). Refrigerate. Some people like adding lemon, but I don’t. I like making this with Thai tea — “black tea powder,” which comes seasoned with spices and full of orange food coloring. 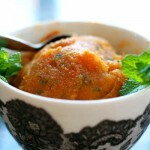 I store it in the fridge, and add a swirl of sweet cream (15% fat) to each glass before serving. Coconut cream works, too. 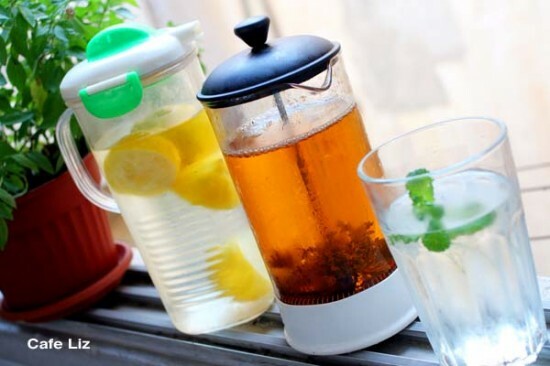 7 Responses to "Refreshing drinks for summer"
I love the lemon in water. I do the same thing thru summer.. have mint growing in my backyard. cute bikini vase. It’s great, isn’t it? Thanks. That vase is genius! gotta get one. Thanks for making great iced tea! BTW I like your portfolio, going over the photos …. Hi Alice, that’s a French Press. It’s traditionally used for making coffee, but it works well for teas, too.